Prepare 2 bread loaf pans ( 81/2 x 41/2 X 21/2 inch) by greasing and flouring bottom and sides. In a medium bowl, mix together flour, salt, soda and cinnamon. In a mixing bowl, beat together eggs, sugars, vanilla and oil until well-combined. 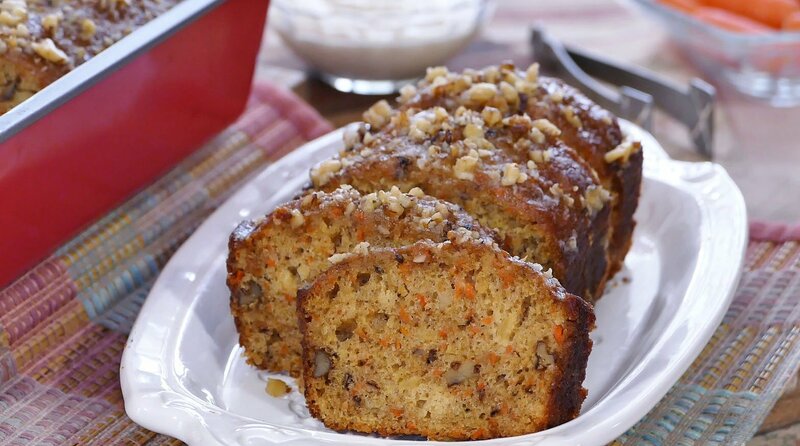 Stir in grated carrots, pineapple and walnuts. Stir in flour mixture until just moistened. Do not over mix. Spread evenly in both loaf pans. Bake at 350 degrees for 55 minutes or until toothpick comes up clean. Cool in pans for 10 minutes. Run knife around the edges and remove to cool on a rack. Serve with Pineapple Cream Cheese Spread. In a medium pot, combine butter, sugar and buttermilk. Stir to dissolve sugar then bring mixture to a boil. When mixture comes to a boil, immediately add 1/2 teaspoon baking soda and stir once. The mixture will foam. While still foamy, pour half of mixture over each loaf of Carrot Pineapple Bread. Whip together cream cheese and crushed pineapple until light and creamy. Spread over slices of Carrot Pineapple Bread. Mix 1 cup milk with 3 tablespoons of lemon juice or vinegar. Stir and let sit for 15 minutes to thicken.